Mon Ami Gabi was the 9th busiest restaurant in the US with $36 MM in sales in 2010. Mon Ami Gabi went through about a ton of potatoes every day. Mon Ami Gabi's french fries were hand cut using blades specifically configured for the restaurant. Mon Ami Gabi seated about 600 people--150 on the patio. Mon Ami Gabi was a chain with locations in NV, IL, MD, and VA.
Mon Ami Gabi was in possession of a time machine at the time of this review, because that was the only way to explain the blazing speed with which menu items were delivered to the table. Happy Meal and I were spending Thanksgiving in Las Vegas as a clever way for me to dodge the cooking and cleaning tasks attendant with the holiday. It seemed like a lot of work for the two of us, and the boy liked the idea of all-you-can-eat. We both won. I had been in contact with Mon Ami Gabi's Executive Chef, Terry Lynch, and he was kind enough to reserve a table for us on the patio for Friday evening. The staff was most attentive and accommodating...half of our party of 4 was 40 minutes late due to awful traffic. Happy Meal and I enjoyed our wait watching the fountains at Bellagio, looking up at the replica of the Eiffel Tower, and tearing into savory, hot, crusty baguettes. To accompany those baguettes we had occasion to sample the Carrot Amuse. 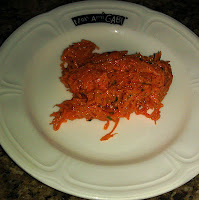 This was a fine slaw of fresh carrots with honey, cilantro, parsley, champagne vinegar, and cayenne pepper. The slaw was delicate, earthy, and just sweet enough to work in balance with the baguette. When our friends arrived, we ordered a bunch of Prime Cheeseburgers. Within a scant 5 minutes, our burgers and fries arrived. The Beef: The beef blend at Mon Ami Gabi was a custom blend of USDA Choice Angus Chuck and USDA Prime Top Sirloin. The 8 ounce patties were formed in-house during morning prep. The burger beef was ground (medium) and blended off-site and delivered by Buedel Meats. The fat content was 20%. That fat perfectly coated the lips without being overwhelmingly greasy. The flavor profile of the beef was marvelous. 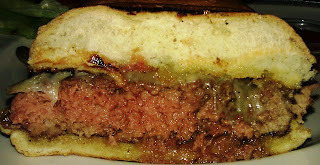 The burgers were beefy with mild notes of funk from 7-10 days of wet aging. The bite also delivered a firm, but not overbearing note of minerals from the Sirloin component. The mouth feel was juicy, tender, and steaky. This burger kept one mindful that it was composed of high-quality ingredients. Happy Meal was equally delighted with the flavor of his burger. The Seasoning: The seasoning was just barely there. At first, I found it a little concerning that such a light amount of seasoning was applied to the beef, but it became clear that this was intentional, after my first bite. The cheese deftly picked up the slack. The Sear: The brief time that elapsed between ordering and enjoying indicated that the heat of the cooking surface was near that of the sun. The sear was dark, flavorful, rich, and it provided just the right firmness. One can observe the thin layer of sear, which encased the evenly Med-Rare interior to appreciate the level of care and practice that went into the preparation of this burger. The Preparation: The burgers were gently formed into evenly round, flat, 8-ounce patties during shift prep. The tenderness and looseness of the bite were indicative that great care was taken when pressing the ground beef. There was absolutely no trace of the proteins forming new bonds. My burger was cooked on a brilliantly hot, gas-fired grill to a perfect Med-Rare. The Cheese: Mon Ami Gabi offered Brie, Bleu, or Gruyere with the Prime Cheeseburger. I went with the Gruyere. I chose well! The Gruyere delivered the usual nutty and buttery notes, but it also came through with a satisfying hit of salt and iron. The savory and well-melted cheese was a perfect match for the gently seasoned beef in terms of both texture and flavor. The Bun: The brioche bun was delivered by Bon Breads. Bon Breads came through with their usual impeccable quality. The brioche was nothing less than perfect. It was mildly sweet. It was buttery and perfectly toasted. The crew at Mon Ami Gabi had the sense not to brush the top of the bun with any oil. I was grateful for this, because I truly detest getting my hands greasy from a burger bun--it is the purpose of the bun to keep grease AWAY from my fingers. The tender, moist, fresh bun compressed perfectly, and it held the juices of the burger at bay without lending any breadiness to the bite. The Meat To Bun Ratio: This was exceptional. The Fries: The ribbon-cut fries were spectacular. 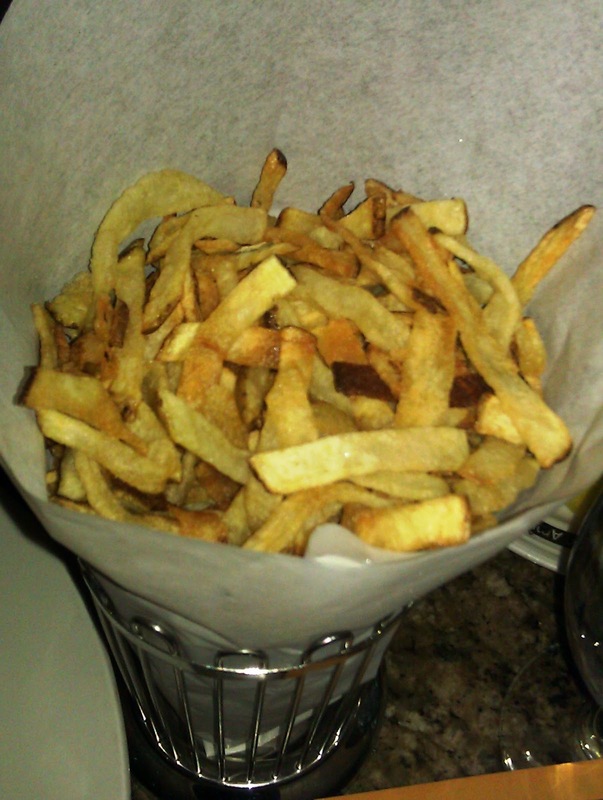 The fries were par-fried and then fried to order in very fresh vegetable oil. The fries were crisp to the point of resembling long chips. They were perfectly salted. The portion was massive, and not one of us managed to eat more than a third of the fries, which accompanied each of our burgers. The potatoes were partially peeled prior to being cut, so they retained some of their earthiness. The Toppings: The tomato slices were fresh--this was November, and the tomatoes were Summer fresh. The Iceberg lettuce was crisp and sweet. The Desserts: We tried the Crème Brûlée and the Bananas Foster. Both were wonderful, but I couldn't stop picking at the Bananas Foster. Buttery, sweet, caramel, banana with a fresh crêpe filled with Bryer's Vanilla Ice Cream---delicious. Again, the desserts appeared with unnatural speed. The Value: Mon Ami Gabi only charged $12.95 for one of the best cheeseburgers in Las Vegas (in the country). This delicious burger weighed in at 1/2 pound, and it came with more fries than a human should consume in a week. The value was very good at Mon Ami Gabi. 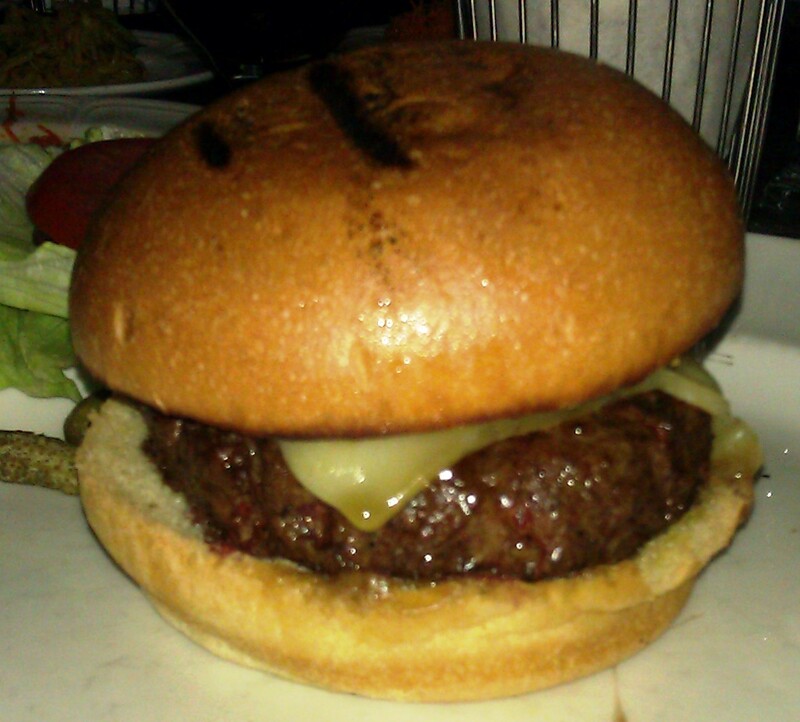 The Prime Cheeseburger at Mon Ami Gabi was a study in refinement and complexity. Each bite delivered no less than 8 sequential notes with the same timing and order. Steak..Beef...Fat...Juice..Funk...Nuttiness...Savory...Sweetness...Butter. It was a bit like eating music. Burger Review : Mon Ami Gabi made one of the most thoughtful and complex burgers, which I have had the pleasure to sample. Sample? Nay, devoured! I ate the whole thing and some of Happy Meal's...it was that good. WOW! That burger looks scrumptious!!!!! Big time! It was thoughtful, complicated, consistent, reasonably-priced, and delivered with amazing speed. Plus it came with a gang of fries! It is my new go-to burger in Vegas. The view from the patio is spectacular. I always scour the burger spots when in Vegas - and hit this spot (after reading this review) a couple of weeks ago. There was a long line to be seated outside (the weather was perfect), so we opted for indoor seating -- as we were STARVING! Fortunately, they led us to the outer most fringe of the indoor area, actually right next to outside tables - and we were just in the shade, enjoying the breeze... PERFECT! I was really looking forward to an amazing burger. What I received was just "good". It was ordered rare, but came m-rare (almost medium). I don't think that made a great deal of difference... it was just a good (not great) burger. I really did not care for the fries. If I had wanted potato chips, I would have ordered them! "I truly detest getting my hands greasy from a burger bun--it is the purpose of the bun to keep grease AWAY from my fingers." OK OK! LOL :) When the secret service finally captures you they'll know exactly how to make you talk. Forget spiders and testicle electrodes. It oily buns for YOU, punk! 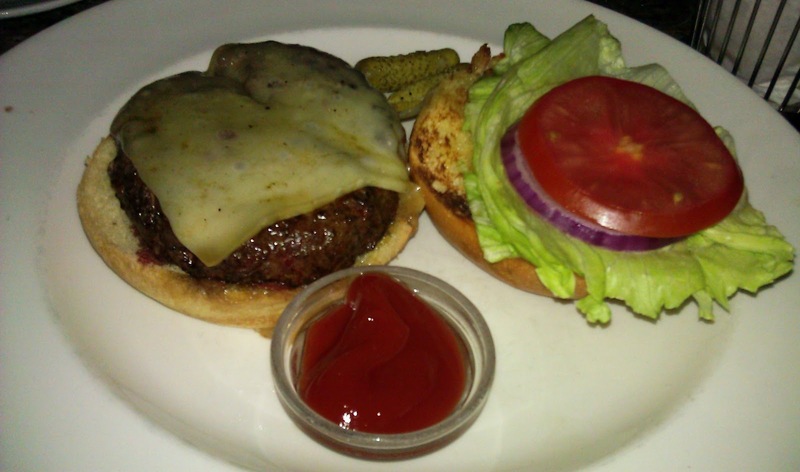 "The Prime Cheeseburger at Mon Ami Gabi was a study in refinement and complexity. Each bite delivered no less than 8 sequential notes with the same timing and order. Steak..Beef...Fat...Juice..Funk...Nuttiness...Savory...Sweetness...Butter. It was a bit like eating music." I don't often go to Vegas, but when I do, I know where I'm going first. Thanks for the heads up. Can't wait to munch on this thing.